Speed blogging at the Wine Bloggers Conference never fails to be wild and woolly, and this year was woollier than most. 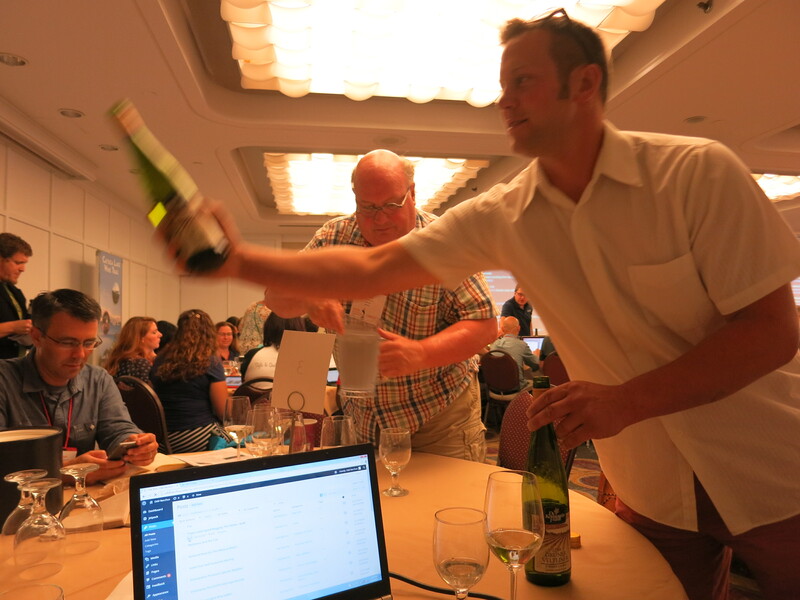 The WiFi during the first session proved woefully inadequate for a giant conference room full of wine bloggers, which made writing my post as I tasted — my preferred method of speed blogging — impossible. So, alas, this post did not come straight from the glass to my blog, it passed through a paper notebook first. —2014 Three Brothers Wineries and Estates Grüner Veltliner: “So Grüner — it’s gonna take over,” presenter Jon Mansfield, one of the three brothers of this winery declared. “It has the best parts of Riesling, Sauvignon Blanc and Gewürztraminer smashed together.” I’m not entirely convinced that’s true, but I certainly liked this Grüner. It had a humid green aroma, Jolly Rancher apple fruit, tart and zesty acids and an almost bitter finish. Surely food-friendly, and unquestionably refreshing. —2014 Americana Vineyards “Apparition”: I’m a little confused by this wine; the fact sheet notes that it’s 100% Vidal Blanc, but the winery’s website describes it as “a blend of Cayuga grapes.” The presenter described it as Vidal Blanc, however, so I’m going with that. In any case, this semi-dry wine had a round aroma marked by some orange and peach, and peachy fruit flavors balanced by very tart acids and a texture verging on petillance. Fun and well-crafted. Not too shabby for a hybrid varietal! —2014 Dr. Konstantin Frank Grüner Veltliner: Peter Weis, pictured above, cleverly flattered his audience, explaining to us that he chose the Grüner because he wanted to pour something “unusual and sophisticated.” He chose wisely. It had a fresh, rather herbaceous aroma, and it tasted wonderfully crisp and bright, with notes of fresh hay, ripe fruit, limey acids and a dry-pasta finish. Delightful. And my word, what a steal at $15 a bottle. Maybe Grüner will be taking over after all? —2014 Atwater Estate Vineyards Chardonnay: This wine was, in a word, bonkers. Harvested from 40-year-old vines, the Chardonnay grapes are fermented with skins, seeds and even some stems, and the juice then sits unfiltered for six months in neutral oak barrels. Nor does Atwater filter the wine when it comes time for bottling. It ends up looking quite turbid and bright orange, like a slightly more subdued Tang. “This is a style of wine made since the beginning of time,” the presenter explained, “fermented in open-top wood bins.” It smelled almost perfumed, and it had quite a texture. Citrus, ripe stone fruit, and a tart, dry finish. Fascinating! —2012 Wagner Vineyards Caywood East Vineyard Dry Riesling: Presenter Katie Roller poured Wagner’s first single-vineyard Riesling, which proved to be quite tasty. Aromas of orange and shower curtain, and appley fruit, tart acids and a dry finish. Well-balanced and a good value at $18 a bottle. Another fine effort from Wagner. —2014 Lamoreaux Landing Red Oak Vineyard Riesling: This wine was named by someone important, I didn’t write who, as one of “The World’s Top 20 Single-Vineyard Rieslings.” That’s a lot to live up to — the world has no shortage of superb single-vineyard Rieslings. But I must admit I really liked this wine. It felt classy and refined, and it took me on a nice flavor journey. Ripe fruit, some exotic spice, a pleasantly dry finish… Really lovely, and at $20 a bottle, it’s a deal. —2010 Casa Larga Fiori Delle Stelle Vidal Blanc Ice Wine: “Ice wine — it’s not just for breakfast anymore,” according to Leslie, the vivacious presenter. Made from vines grown on the extreme northwest edge of the Finger Lakes AVA, this Vidal Blanc ice wine takes no shortcuts. The winery lets the grapes hang on the vine until they freeze naturally, rather than harvesting them and freezing them by artificial means. The effort pays off; the wine has a gorgeous rich gold color, a fresh honeyed aroma, and a lush texture balanced by orangey acids. It’s pricey at $40, but making ice wine is risky business. —Whoops! No one presented a wine to us during this five-minute block, despite my increasingly loud pleas for someone to pour us some wine, for heaven’s sake. Our glasses, sadly, remained empty for all five minutes. It doesn’t sound like much, but five minutes without wine at a Wine Bloggers Conference is an eternity. —2014 Boundary Breaks Dry Riesling #239: “I bet everything on Riesling,” Boundary Breaks owner Bruce Murray confided. “I took my life savings and I put it in the ground.” I’m not one to support gambling, but I can’t deny I’m glad Murray went all-in: #239 tastes fantastic. The number refers to the Riesling clone from which this wine is made, Geisenheim #239, named after the German wine research institute which popularized it (see page 29). It has a really ripe and fruity nose, and plenty of rich tropical fruit on the palate. That moves to some focused spice and some tart acids, keeping everything wonderfully balanced. Well worth the $20 asking price. —2013 Hazlitt 1852 Vineyards Sauvignon Blanc: Winemaker Michael Reidy presented this delicious Sauvignon Blanc, of which only 600 cases were produced. “I use as many yeasts as I can to get complexity,” he explained. “because we machine-pick [the grapes].” I rather loved this wine, with its dewy grass/green hay aroma, creamy fruit, supple white-pepper spice and surprising light-caramel finish. A great value for $19, and a thoroughly delightful finish to Speed Blogging, Finger Lakes Whites Edition! For more speed blogging action, check out this post about Finger Lakes reds. Oh so sad, you had an empty five minutes! 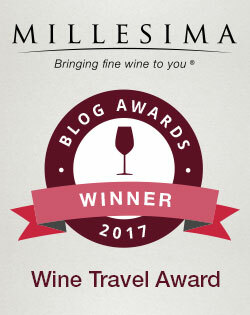 I would have been forlorn–and it made my conference critique that some of the wine pourers needed to be better prepped for the speed-blogging experience! I am still thinking about that Atwater Chardonnay too, and the Dr. Kosentin Frank Gruner was impressive. It was sad indeed! Ah well. I’m glad I wasn’t the only one who mentioned the preparation of the speed blogging pourers. Yes, the conference really needs to be clear about what’s needed, because it’s such an unusual tasting situation!